West Inishowen History & Heritage Society » Has the ‘Voice of the People’ been silenced? Has the ‘Voice of the People’ been silenced? 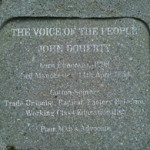 If you take a stroll along the shore front in Buncrana, Co Donegal and you might spot a stone plaque commemorating “The Voice of the People”. Born in Buncrana in 1798, John Doherty became a trade unionist and newspaper editor who spent his life campaigning for workers’ rights. As one of the founders of modern day socialism in Britain and Ireland, he was ahead of his time. Yet his name is rarely mentioned in history books and his story has faded, even in his hometown. Speaking at a West Inishowen History and Heritage Group lecture on Thursday 23 February, Dr Adrian Grant recounted highlights from John Doherty’s life story and reminded his audience of the significance of “The Voice of the People”. John Doherty started working in the mills in Buncrana at around the age of eight or nine. As a child labourer, the young Doherty would have experienced the factories as “hell holes” and was probably radicalised in reaction to the way workers were treated. In his teens, Doherty worked in Trim, in Co Meath before moving to Larne, near Belfast. At 16 he crossed the Irish Sea to seek better paid work as a cotton spinner in Manchester. 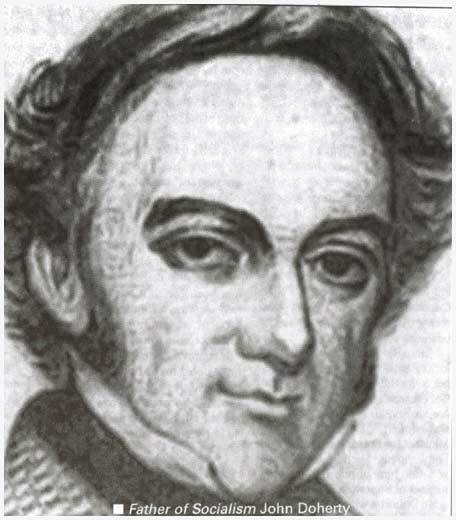 A radical and a hothead, Doherty led an illegal Cotton Spinners Strike in 1818 – an action that resulted in his arrest. When 2000 workers started rioting in support of Doherty and the other strike leaders, he was sentenced to two years in jail for incitement to riot. By the time he got out of prison, Doherty had become a hero and quickly rose through the ranks of the trade union movement. 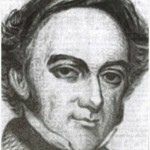 Elected secretary of the Manchester Cotton Spinners Union in 1828, Doherty faced opposition from others who were fearful of his radical views. 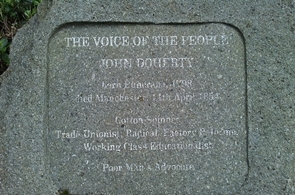 Doherty was one of the first to advocate for federation of trade unions. Recognising the power of united action, he sought to bring workers together. He believed that united action could bring about real change and ensure that workers were protected. However, attempts to unite all of the Cotton Spinners unions and a later effort to develop a National Association for the Protection of Workers were ultimately unsuccessful because of in-fighting and petty squabbles between unions. Doherty was ahead of his time. It would be almost another 100 years before unions and socialism finally lived up to his vision for change. In the meantime, Doherty took to publishing as editor of the “Voice of the People” newspaper (circulation 30,000) and later “The Poor Man’s Advocate”, as well as booklets and pamphlets promoting workers rights. He continued to campaign for factory reform, child labour laws and children’s rights throughout his life and was a staunch supporter of Irish nationalism. He died of heart disease at the age of 83. It seems sad that such a passionate voice for change, could have been so quickly forgotten!